Our friends at Agonist (aka. Those weird glass art bottle people) have a new offer on the table with Liquid Crystal. For those of you turned off by the price tag and bottle design of The Infidels, you might be swayed to like Liquid Crystal a bit more. As for the price tag–well, that’s probably not going anywhere any time soon. In Bottle: Sweet citrus, barely there though as the lavender hits up the forefront right away. I smell predominantly sweet lavender. It’s a beautiful lavender though so I’m okay with that. Applied: The citrus opens this up with a sweet note that’s quite pleasing and does well to help lead in the lavender notes. This is full-bodied, complex, high-quality lavender at its best. It’s like fields of lavender basking on a sunny day. It’s very pretty for a fragrance that’s dedicated to one rather predominant smell. You can tell the lavender is good and blended well with the slightly sweet notes also present in the fragrance. This doesn’t smell like straight up lavender essential oil as there’s some mild hints of clove and oregano that I get from this when the lavender starts to calm down a bit near the end of the show. She’s not one-dimensional, she’s prominently biased on one note but allows a mixture of other elements to merge and form something that amplifies the beauty of that one note. With that having been said, it is very much based on lavender and that is what you will smell the most here. So if you hate lavender for some reason, you will probably hate this. Extra: I’m going to talk about the bottle for Liquid Crystal because the bulk of the money basically goes into the packaging for Agonist’s stuff, it seems. The bottle is handmade, which adds to its value. It’s intricately designed, add more to its value. And it’s a high end niche brand, more value added. So it’s no surprise that you are going to have to pay up a pretty penny for this. I wouldn’t mind if I had a few million dollars laying around and $1,200 was pocket change as the bottle is gorgeous. It comes in two pieces, a stand and the bottle itself, so if you don’t like the melted glass look of the stand, you still have the bottle to display on its own. Though it looks fantastic on that stand too. Design: Agonist’s bottle designs have been that one polarizing element to their stuff, and while I knew a lot of people who hated how The Infidels looked, Liquid Crystal is an easier to accept design. It’s absolutely intricate, very interesting to look at and makes for an absolutely fabulous conversation starter. “Hey Kay, I noticed you’ve got this weird artsy doohickey on your coffee table.” “Thanks, it’s Liquid Crystal from Agonist.” “Oh, is that what it’s called?” “Yeah, it’s a perfume.” “Really? A perfume? Where’d you get it?” “Oh, I got it online. it’s a bit expensive though.” “Expensive? Like $200 or something?” “Um, $1,200.” At that point I finally admit to myself that I’d never have the spare change handy to justify buying an actual bottle and will settle for refill bottles ($100 for 50ml) and sampler vials. Notes: Bergamot, lavender, english clove, lavandin absolute, lavandin essential oil, oregano, vetiver, coumarine, praline, everlasting flower. In case you were wondering, yes there’s three types of lavender in the notes. And mixed together, it’s just lovely. Reviewed in This Post: Liquid Crystal, 2011, Eau de Parfum. 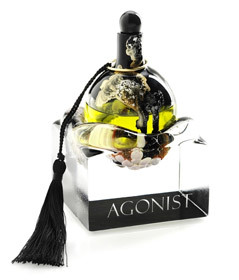 This entry was posted in agonist, aromatic, Reviews By House and tagged bergamot, clove, coumarine, everlasting flower, lavandin absolute, lavandin essential oil, lavender, oregano, praline, vetiver. Bookmark the permalink.